UNITED NATIONS, August 10 -- As the Security Council on Friday passed a resolution to expand the UN's role in Iraq, there was a lot of diplomatic side-talk bidding farewell to UK Ambassador Emyr Jones-Parry and welcoming Jean-Marc de la Sabliere's replacement as Ambassador of France, Jean-Maurice Ripert. There was also a U.S. - Iraqi pas de deux. U.S. Ambassador Zalmay Khalilzad, putting his relationship with Iraq on display as he did on Thursday, after the Iraqi Ambassador had answered a handful of questions told him, "Good job," like a coach to a player. Or perhaps it was player to player. "I don't want to talk about the past," Amb. Khalilzad said when asked about the U.S. not having gotten UN approval to invade Iraq. "We followed our own processes and they were legitimate." In another process, Amb. Khalilzad mentioned Staffan De Mistura as the new UN envoy to Iraq, and was asked if he should have said so before Secretary-General Ban Ki-moon made the nomination. Amb. Khalilzad called him the "likely" person. Mr. Ban, just returned from Barbados and flanked by advisors, also spoke to the press at, or next to, the stakeout. Strangely, rather than stand in front of the microphone and camera, he stood to the side, face to face with reporters. He said he takes seriously staff's concerns about safety -- expressed in the Staff Council's unanimous resolution to suspend presence in Iraq until safety can be certified -- but he said that the UN must be in Iraq. He told reporters, "I am going to ask for the increased budget support for strengthening the safe housing accommodation in Iraq." Minutes later at the UN's noon briefing, Inner City Press asked Ban's spokesperson's office to confirm or deny that the Secretariat told the Advisory Committee on Administrative and Budgetary Questions that it wants to spend $130 million on a new UN headquarters in Baghdad, and that ACABQ responded negatively. Video here, from Minute 9:27. The Associate Spokesman referred back to Ban's quote about housing, and said he did not think any dollar figure had been made public. We'll see. Amb. Jones-Parry months ago spoke of "hanging up his jersey." Recently which jersey became more specific: he is headed to a university in the UK, specializing in foreign affairs. Asked which books about the UN he would recommend, and if he'd write one, Jones-Parry said humbly that he doubts he has the talent to write one, and that he hasn't had much time for reading. 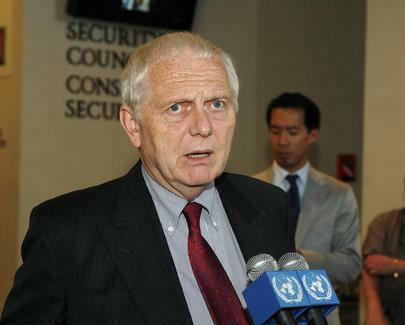 A presence at the UN since 2003, he will now fall out of the photo rotation on the two huge Samsung flat screen TVs recently installed in the lobby and the press floor of the UN, "Ban-o-vision." In other transition news, the also just-left Japanese Ambassador Kenzo Oshima mused in a final photo session that Yankee outfielder Hideki Matsui might be serve as a goodwill ambassador. Who knows -- if he keeps hitting homeruns, maybe he'd be the one to get Japan a permanent seat on the Security Council. Amb. Oshima said that there are three ways that diplomats leave the UN. They get fired, they get promoted, or they retire. Oshima put himself in the third category, and named the Republic of Congo Ambassador, Basile Ikouebe, as an example of being promoted, in his case to Foreign Minister in Brazzaville. And so his deputy, Pascal Gayama, is heading the Council this month. The stakeouts, which are not translated, are in French. One assumes that M. Ripert, or the departed de la Sabliere, like this co-equality of la langue francaise. Of Amb. de la Sabliere, one particular evening stands out. It was chez the Slovakian Ambassador, a second floor parlor, wine and canapes and, central to this story, peanuts. De la Sabliere was drinking wine, snacking and holding forth about Lebanon and wire service reporters stood rapt. Little by little, a Francophone radio reporter inched closer, eager to ask about Cote d'Ivoire. When finally he got in front of the diminutive Ambassador, he had to pay an additional price. Fragments of the peanuts were flying; with saliva asking as adhesive, they stuck to the front of the radio reporter: shirt, face, hair, it was a fusillade of nuts. And once he got his quote, a wire service reporter told him, You know this is all off the record.